All indications are that rookie Brandon Saad will play in his third NHL game on Thursday night, replacing injured Marian Hossa. What should Hawks fans expect? Saad’s great numbers this season in juniors have been repeated a hundred times by every Hawks reporter/blog out there this week: 34 goals in 44 games with Saginaw of the OHL. But there’s a key part of that statement that cannot be ignore: he was in juniors. Now, the 19-year-old second round pick is getting thrown into the fire in a series that got serious in a hurry on Tuesday night when Raffi Torres ended Marian Hossa’s night early. Saad skated over 28 combined minutes in his two regular season appearances, the first two games of the season against Dallas. His workload including 14:57 in the Hawks’ 5-2 victory that began their home schedule this year. Saad was credited with three shots on goal in the two games. But there is a huge risk for the Hawks to put the teenager in the lineup, and that concern was made real in Game Three. The loss of Hossa, arguably one of the best two-way forwards in the league, was compounded by rookie defenseman Dylan Olsen’s apparent deer-in-the-headlights response to his first NHL playoff action. To say he looked timid on the ice would be as accurate as saying Andrew Brunette looked a touch slow; Olsen appeared to be overwhelmed, and coach Joel Quenneville limited him to nine shifts and under five minutes of total ice time on the night. The Blackhawks effectively played over 73 minutes of intense playoff hockey with 11 forwards and five defensemen; their bench was essentially short two players all night. There’s a reason Michael Frolik has skated in place of Jimmy Hayes, and it wasn’t Quenneville believing that he would score a goal for the first time this calendar year. Experience means a great deal in the NHL playoffs, and the Hawks are going to battle with two 21-year-olds playing major minutes already (Nick Leddy and Marcus Kruger). Fans and media members (and Blackhawks management) can hope that Saad’s playoff performance in the OHL this spring (17 points in 12 games) carries over and that his sky-high confidence breeds a naivete that keeps him from being consumed by the moment. But if Saad is shaky in any way, a series that has seen all three games go well into overtime could be taxing on the Blackhawks’ top players yet again. There’s plenty of hype coming to the game with Saad tonight. How will he respond? And how will it impact the rest of the Blackhawks roster? Those burning questions could determine the result of this first round series. Thanks Tab, Good read. I hope he plays well, I’m very high on him. I remember those first two games against dallas and he did not look as comfortable in those as he did in the preseason. I hadn’t given that much thought untill you brought up oslen being timid in his first post season NHL game. now I’m slightly concerned. I love the idea of him being a Strong left 20-30goal a year wing opposite Hossa or Kane. But we will see. Tab I expect the Phoenix thugs to go right after him early. How the refs didn’t call a penalty on Torres is incredible. Aren’t the refs being reviewed as well and doesn’t the league ususally say something when refs blow major calls? Crawford should not be overlooked ! This is playoff hockey and we have seen in the NHL during the first round that 50% of the goalies have holes in their gloves . He should of had that goal but was looking at whatever?? Maybe Saad will be fine since Shaw sure has proved us all wrong . I have noticed lazy players bring bad penalties like tripping and etc. These men are being paid large salaries and if they don’t want to get their nose dirty maybe they should play tennis ? Shaw has impressed us since he is hungry . Great informative article. Hopefully, this young rookie can get the job done in a big way for the team. Hawks have strength and courage through adversity on the bench, their hearts will be heavy not having Hossa in the #81 jersey on the ice for tonight’s game, but adversity makes one stronger, fans will be cheering from the rafters, which should give these rookies a booster shot in dominating the game. We have to control our penalties, make clean checks, be on top of the puck, dig dig and dig. We have to have guys picking up those rebounds. Let’s even up the series. Do it for Hossa! Valid point Tab. Not only from the perspective of winning this crucial game, but if Saad goes “deer in the headlights”, that could bode ill for his development track toward becoming an NHL player. His OHL season and playoffs surely were confidence builders but a big fail in a crucial playoff game, depending on his psyche, could stick a pin in that balloon. Rushing a young player can sometimes retard development. But – the Hawk’s don’t really have a better option at this time. Playing Morrison would be akin to trying to catch (past) lightning in a bottle – highly improbable. Playing Hayes would provide energy and some physicality but there’s a reason he averaged only 10:15 TOI over his 31 games played – he’s a 4th liner who tends to run out of gas if he plays more than that. Neither player provides anything close to the missing Hossa contribution. 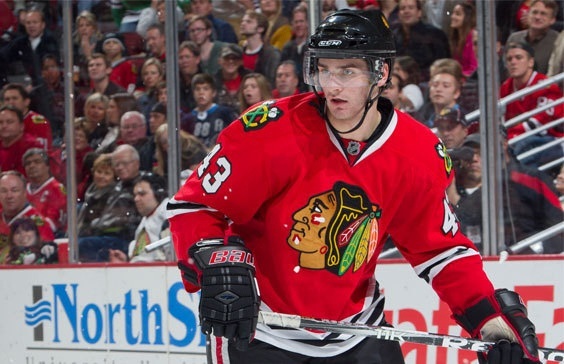 Saad, at least, has the potential to provide scoring and good 2-way play. Phoenix will definetly shine their headlights into his eyes, early and often. The question to be answered tonight if will Saad freeze or heat up. Is it fair to assume that Hayes can’t be a Buff presence in front of the net so that’s why he’s been out? You’d think someone like him would be helpful this time of year, as it was in 2010…. I like “freeze up or heat up” good way to put it. Off topic but do you think Sedin will get a fine or suspenion for his elbow to Browns head? Its cleary a retaliation play like Keiths and its a hit to the head of a vulnerable player since he was on his knees. I still think Hayes is a better option than Brunette. The Hawks need size in this series as they are getting pushed around a bit. Saad or Morin I guess they prefer Saad but there are lots of rookies playing in this years playoffs, look at the Flyers they seem to be doing well. I guess we will see tonight. Go Hawks. Baron- We are not as far off as you insinuate. How do we need two d-men, center and 2 wingers? I’ll Give you one defender and a Center. If you replace Bruno with a true second line Center that would give us 25/19/88, 10/new Center/88. That would be easily be in the conversation for best 1-2 punch in the NHL. the 29/36/65 was as good a third line there was in the last month, and then we have Carbomb/Kruger/Mayers. Olsen has look good at times, but could use one more year of seasoning. So bring in a 2nd Liner so the third line can be Hammer/Leddy. Craw has looked good these playoffs. Sure we are down 2-1, but its not like hes not making good saves. Should that last goat have gone in, no… but then again he stopped a couple that should have been in. He’s not great and still have room to develop, but we got to let him. BTW: Hints floating that Olsen might be sitting tonight. OD would be in. Tim I agree that the hawks are not that far off but Kane cant double shift every game as your lines suggest unless you mean 81 on the top line. Very good article Tab…these are salient points that are pushing the Hawks to the brink of cracking…too many rookies, too many injuries, etc…will this team unite around these extreme pressures or will they fall??? As I said the other day, I think they will rally around Toews and Sharp…this team has character, but you have to dig a little to find it…and once it is aroused, the Hawks are as good as anyone in the league. So as I said, the attack on Hossa may just be what this group needs…Saad is a rookie, but like Shaw, he is mature and calm beyond his years…and for Brandon it is either stay focused and play or lose his cool and get overwhelmed, thus I think he will keep himself together. The Blackhawks are down 2-1. I’m nowhere close to saying they’re near “the brink of cracking,” especially after three 70-minute games. With Torres out of the lineup, the playing field… err, ice… should now be level w/ the head-hunting Torres out of the lineup for the rest of the series. Hopefully that opens things up for the Hawks’ snipers to start skating with confidence and going into the dirty areas more regularly. Crawford may have “failed us once again,” and you are absolutely right that everything rides on him. I’m not even totally sure that was an intended shot that won Game 3. But the gus in front of him should be scoring enough that we don’t get to a soft goal at 73 minutes winning a game. Torres is what he is, which is a thug pretending to play hockey. What angers me the most is that the officials didn’t even call a penalty. It should have been a 5 minute major and a game misconduct. Instead he is still skating around out there looking to take someones head off. The official that missed that call should not be working anymore playoff games. I doubt we lose that game if the correct call had been made. As for Saad, they will definitely go after him and I expect cheap shots to the head on him. They should call a tight game on Phoenix tonight and that should lead to our skill players taking over. What do we do about H. Sedin’s elbow to Brown’s head last night. Seemed like a cheap shot to me. D. Sedin drove a shoulder into Keith’s head prior to the elbow from Keith. Watch Chicago enough and you’ll see they don’t have the hair pullers, biters, Divers, or whiners that Vancouver has. The Hawks had to sign players like the Car-Bomb to compete at your level. Sorry to deter from Saad thread, but has anyone ever heard what really happened to Hossa? Forums and message boards across web are speculating severe whiplash to broken jaw (and concussion). Not sure about any of that talk since he was immediately released from hospital. It would be nice to know if his absence is short lived. Gut feeling is he won’t be back until October. Here’s to hoping Saad is one of the 3 Hawk stars of the evening after the game. I wasnt’ that disappointed with Olsen time on Ice…. He didn’t hesitate to put the puck on the net. I honestly didn’t know why he wasn’t out there more. I though the dparing of Leddy and Johnny O was horrific, their worst game of year. I also don’t expect anyone to go after Saad, at least illegally or intentionally. I think the NHL has had to put a memo out regarding headhunting. If they haven’t reiterated their displeasure with dirty play directly to the players, then they are stupid. Truthfully, only expect Saad to make safe passes, back check and keep his game simple… If he gets lucky he may earn a point. But I’m sure Q has instructed him to do the little things. Kurt they are going to take runs at our skill players right out of the gate. Phoenix knows they have to play that way to win and they will do it. If they can shake up our skill players (regardless of the rules) they know they can win tonight. The officials basically let Torres get away with it. Its beyond outrageous that Torres stayed in the game after hitting Hossa. ……..Chicago has just scored for the third time in four games in the last few minutes with the extra man and pulling Crawford…….interesting…….maybe they should play this way all the time……..
Re: Saad……..He played the first two games of the season and will probably play the last two games of the season…..so sad…..
Wow! Leddy and Odonnell on the ice at the same time, and both get caught out of position in OT. Last game Kane tries to stick handle through 2 guys and turns it over. They played like this when they won the cup too. The problem is they no longer have twice the talent of their opponent to make up for the complete lack of discipline.